We often pick up a pork fillet at the butcher’s as they are cheap and versatile. Make the salsa before you start cooking the pork so the flavours have time to develop. Prepare the pork by removing the sinew from the surface. Cut each fillet in half. Mix the salt, chipotle paste, olive oil and some freshly ground black pepper in a small bowl. Rub the marinade all over the pork pieces. Leave in the fridge to marinate for at least half an hour, or up to a few hours. Heat the oven to 170ºC/gas mark 3. Put a non-stick frying pan over a medium heat, brown the pork evenly all over. Transfer to a roasting tin and roast in the oven for 20-25 minutes or until cooked but still juicy. Test by inserting a skewer into the thickest part for 10 seconds, then rest it on your inner wrist; it should feel hot. Remove from the oven and leave to rest for 5 minutes before carving on the diagonal into 7-8mm thick slices. Spoon the salsa onto a platter and top with the pork. Peel and finely dice the red onion and put into a bowl. Finely grate the zest from one of the limes and squeeze the juice from both. Add the lime zest and half the juice to the onion, saving the rest for seasoning at the end. Cut the avocado into even dice and thinly slice the spring onion. Coarsely chop the coriander leaves. 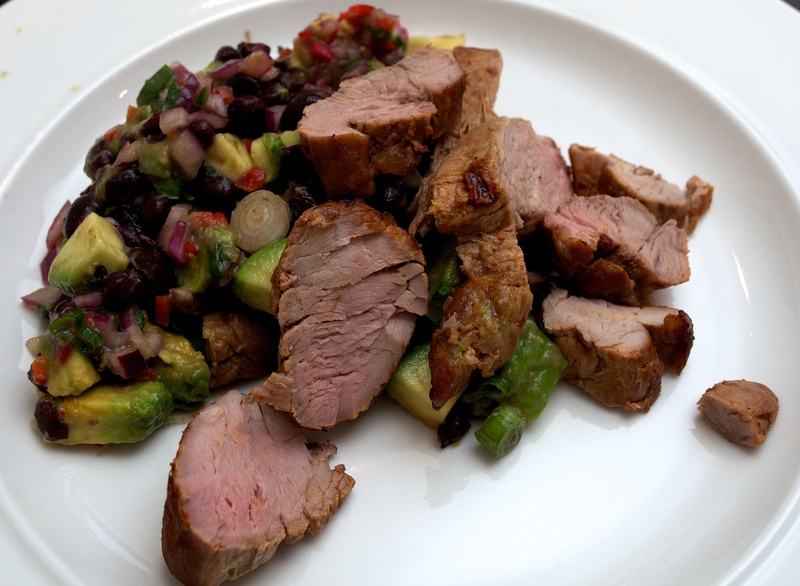 Stir the avocado, black beans, spring onion, and coriander into the onion and lime mixture. Stir in the olive oil and season well with salt and more lime juice if needed. Leave to stand for 30 minute for the flavours to develop.